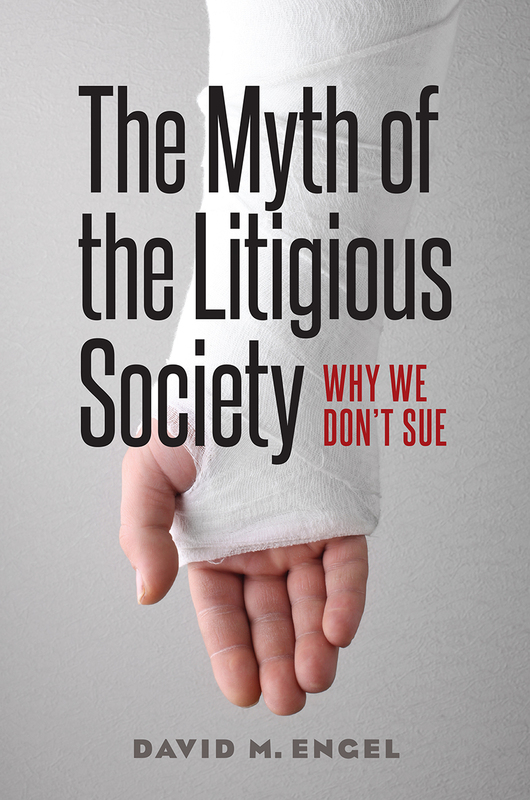 THE MYTH OF THE LITIGIOUS SOCIETY: WHY WE DON’T SUE, by David M. Engel. Chicago: The University of Chicago Press, 2016. 248pp. Cloth $24.00. ISBN: 978-0-2263-0504-2. Ebook $18.00. ISBN: 978-0-2263-0518-9. Reviewed by Aaron J. Ley, Department of Political Science, University of Rhode Island. Email: ajley@uri.edu. To explain the propensity of injury victims to “lump,” Engel develops a model that draws on work from a variety of disciplines, including “rehabilitation science, nursing, anesthesiology, and neuroscience” (p. 4). His model goes beyond the dominant theories of claiming that are grounded in economic and cultural explanations. According to the rational choice model which is based in economic theory, claiming occurs only after injury victims have carefully weighed all of the costs and benefits of asserting their claims. The cultural theory of claiming, on the other hand, explains that victims choose not to claim because powerful social norms deter it. Engel concludes that a new model of claiming is necessary because, while some support exists for these traditional models of claiming, they nevertheless fall short of capturing empirical reality (especially the rational choice model, which Engel finds to be more normative in nature). Before introducing his model, Engel provides the reader with a brief guided tour of the existing literature on claiming behavior by personal injury victims, which allows him to introduce Felstiner, Abel, and Sarat’s (1980-1981) model that describes lumping as an alternative to naming, blaming, and claiming. It models the injury victim as being rationally motivated and as moving along a unidirectional series of linear decision stages that more commonly lead to lumping rather than claiming. To Engel, this model is “deeply flawed” because it is “an unrealistic image of injury and response that bears little relationship to injuries as they actually occur or to victims as they actually live, breathe, and cope with the dire consequences in which they find themselves” (p. 36). Engel proposes to overcome these theoretical flaws by focusing instead on the experience of injury while describing the non-linear character of decision-making that occurs in the aftermath of an injury. The experience of an injury, for instance, may impose excruciating and debilitating pain that cause sensations of disembodiment while also requiring the consumption of pain medication that muddles thought processes. [*9] It is, moreover, common for injury victims to experience a personality change, which causes victims to withdraw from family and other social support systems. Rational and highly linear models of autonomous decision-making are undermined even further when considered alongside a wide body of psychology research demonstrating that our bodily sensations and interrelationships influence our nonconscious thinking and decision-making. To Engel, all of these observations make it “a mistake to imagine that the typical injury victim suffers damage to the body and then, in effect, refers the matter [of asserting a claim] to his or her brain for a conscious assessment and response. Instead, it is more accurate to imagine an organic interconnection of environment, body, and mind” (p. 54). Engel draws upon a range of multi-disciplinary insights to develop a model that explains the widespread practice of lumping. It is one that allows researchers to “imagine body and mind together experiencing and interpreting the injury…. [and] that the initial cognitive work takes place nonconsciously in ways that largely determine the conscious thought processes that follow” (p. 63-64). To Engel, the process of decision-making in this model is multi-directional and non-linear because victims experience a range of different “thoughts [that] rush in many directions” (p. 73). It is a model that also takes into consideration a range of other factors within the broader social and physical environment that shape decision-making processes in non-rational ways. A key element of any injury claim, for instance, is being able to establish a line of causation that links the victim’s injury to the action of another. The pain and disruption that is experienced by injury victims, however, alters and distorts perceptions of causation in a variety of possible ways that are bound by historical time, morality, or the cultural and religious experiences of the injury victim. Another key element of Engel’s model is our physical environment, which is altered, designed, and given meaning by humans. These features, in turn, shape our experience with injury and our relationship with the tort system. Take, for example, the experience of injury victims having been injured by one of the most common humanly-designed sources of injuries: stairs. Whether a stairway injury is claimed depends on the meaning and location of the stairs, how the injury occurs, and/or whether the victim has a relationship with the property owner. Whereas establishing causation for stairway injuries is straightforward because they are injuries borne by a victim at a single point in time, causation for injuries that slowly build over a longer period of time is made even more difficult to establish due to the cumulative nature of the injury. Chairs and the QWERTY keyboard are two ubiquitous features of the human-built environment causing significant and routinely lumped injuries because, in addition to the problem of identifying causation, these are institutionalized parts of our environment, culture, and daily life. In addition to our physical, social, and cultural environments, the influence of others (e.g., our community, professionals, etc. ), shape how injury victims choose to respond to their injuries. By building on his previous work, Engel demonstrates how these broader influences interact to cause socially acceptable responses to the injury, which usually takes the form of lumping. Engel concludes with several insights that form the basis for his response to widespread lumping of injury claims and reminds readers that it is a behavior that interferes with the deterrent, compensatory, redistributional, and moral functions of our tort law system. How can we improve upon the shortcoming of our tort system in order to realize its promises? While acknowledging a series of existing “work-arounds” such as access to legal services, high profile impact cases, class-actions, and regulation, Engel proposes “a more balanced, humane, nuanced, and respectful [*10] framework for understanding injuries, injurers, and injury victims” (pp. 190-191). Too often, the dominating narrative of self-sufficiency, which shifts the responsibility and cost of injury to victims, overpowers the narrative of social responsibility, which, according to Engel, “would emphasize that we are all potential victims” (p. 192). In his mind, a cultural shift is needed where the broader narrative of social responsibility should compete against the narrative of self-sufficiency. This could occur through a more effective public relations strategy that includes high profile litigation where, for instance, injury victims can tell their stories in response to the current dominant narrative. This cultural shift is needed in addition to pursuing a public debate about injuries that is empirically grounded. I was expecting to slog through multiple chapters cataloging the dozens of empirical studies measuring the level of American litigation when I began reading this text, and I am glad that I did not. I liked how Engel cast his focus on a key element of claiming and lumping that is so obvious on its face that the simplicity of its explanation has caused us to ignore its significance – the nature of injury. Engel effectively portrayed the mental, physical, and relational disruptions that are littered throughout the aftermath of an injury and are borne by badly injured victims who are responsible, yet ill-equipped, to seek justice against their perpetrators. His creation of a new model of claiming and lumping will allow scholars to generate new testable hypotheses that will advance our understanding of widespread lumping. By shifting his focus to the experience of injury, it is now possible to begin generating insights about the types of injuries that lead to widespread lumping. Scholars might ask whether injury victims having experienced significant pain for the first time are more likely to lump than victims having prior experience recovering from surgeries, assault, or pregnancy, for instance. This is a model that can be used to generate endless possibilities for new research questions. Although critics may charge that Engel’s book is not a methodologically rigorous one, the author’s purpose was to generate a new model of claiming and lumping that improves upon the shortcomings of past models. Engel accomplishes this without assaulting the reader with academic jargon that can only be deciphered by socio-legal scholars. Therefore, it is a book that can safely be assigned to students as a supplementary text to upper-division judicial process and Law & Society courses, as well as graduate-level courses and the law school classroom. After reading the text, students should be conversational about all of the factors that keep injury victims from claiming their rights. Furthermore, it is a text that can generate discussion about administrative law and injury claims against governments. If lumping occurs at the same rate when the government is the injurer, then a variety of concerns arise about the performance of tort claims that can be made against the federal government and the states. In this vein, Charles Epp (2010) demonstrates how reformers used the threat of tort liability against local governments to set into motion reforms that made playgrounds safer and, therefore, minimized injury risks. If it is true that injury victims are less likely to claim, then it is possible that our ex ante instruments for controlling administrative agencies through liability statutes, such as the Federal Tort Claims Act, are also not performing as intended. Epp, Charles R. 2010. MAKING RIGHTS REAL: ACTIVISTS, BUREAUCRATS, AND THE CREATION OF THE LEGALISTIC STATE. Chicago: University of Chicago Press. Galanter, Marc. 1983. “Reading the Landscape of Disputes: What We Know and Don’t Know (and Think We Know) about Our Allegedly Contentious and Litigious Society.” UCLA LAW REVIEW 31: 4-72. Haltom, William, and Michael McCann. 2004. DISTORTING THE LAW: POLITICS, MEDIA, AND THE LITIGATION CRISIS. Chicago: University of Chicago Press. Saks, Michael J. 1992. “Do We Really Know Anything about the Behavior of the Tort Litigation System – and Why Not?” UNIVERSITY OF PENNSYLVANIA LAW REVIEW 140: 1147-292. © Copyright 2019 by author, Aaron J. Ley.